This Mini Dragon Slide is perfect for ages 2-7. 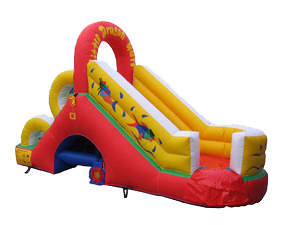 It is one of our smallest slides appox 6-8 ft tall. You can climb to and slide. It features an inflatable safety ramp at the entrance to protect excited kids as they scramble to get inside. Recommend 3 kids at a time, one sliding, one climbing and one entering.This unit will need to be staked or tied of for safety, otherwide water barrells must be ordered.